Global economic recovery remained fragile in 2013, despite improved prospects in some advanced economies. Some emerging economies were unfortunately saddled with geopolitical risks and lower-than-expected inflation, resulting in demand and supply constraints, infrastructure bottlenecks as well as weak investment climates that impacted international business and trade. Despite such external environment, Malaysia's total trade reached RM1.37 trillion in 2013, an increase of 4.6 per cent, boosted by strong demand from Southeast Asia as well as Free Trade Agreement (FTA) partner countries such as Australia, China, New Zealand and South Korea (cf. 2012: RM1.31 trillion). Malaysia's total imports increased by 7.0 per cent to RM649.19 billion and its exports grew by 2.4 per cent to RM719.82 billion, resulting in a trade surplus of RM70.63 billion. Singapore, China and Japan were the top three export markets contributing RM100.44 billion, RM96.97 billion and RM79.75 billion respectively to Malaysia's total exports in 2013. While the overall performance of Malaysia's exports ended on a positive note in 2013, this was unfortunately not the case for Malaysia's timber exports. The export of Malaysian timber and timber products declined 3.3 per cent to RM19.53 billion, mainly due to slow and volatile global economic growth which has taken a toll on the export of Malaysia's timber products. Asia was by far the largest regional market for Malaysia's timber exports accounting for 66.3 per cent of the total timber exports in 2013. However, the exports to Asia as a whole dropped by 0.8 per cent to RM12.95 billion despite Asia's buoyant credit growths, growing middle-class consumers and strong labour markets. Meanwhile, positive growth was recorded in exports to some Asian sub-regions, i.e., Central Asia (17.2 per cent), South Asia (2.0 per cent) and East Asia (0.7 per cent). The exports to the Americas shrunk by 7.8 per cent to RM2.89 billion while Europe slumped by 13.7 per cent to RM2.01 billion. The exports to the Americas and Europe were weakened by their slow economic recovery and protracted financial crisis. The two regions accounted for 14.8 per cent and 10.3 per cent of Malaysia's total timber exports in 2013 respectively. However, exports to South America registered a growth of 11.7 per cent. Malaysia's export to the African continent also recorded a growth of 1.9 per cent. By country, Japan, USA and India were the top three major export markets for Malaysia's timber products since 2008, with a market share of 21.4 per cent, 11.8 per cent and 7.8 per cent respectively. Exports to Japan, however, declined by 2.0 per cent to RM4.18 billion (cf. 2012: RM4.27 billion). This could be attributed to the Abenomics, the Japanese economic policies advocated by Shinzō Abe since December 2012, which translated into strong but not enough domestic private demand for the Japanese economic recovery to be sustained. In addition, the devaluation of Japanese Yen in 2013 had made Malaysian exports expensive. Exports to the US dropped by 7.0 per cent to RM2.31 billion (cf. 2012: RM2.48 billion) due to its economy expanded at a weaker pace in the first half of 2013 hobbled by excessive fiscal consolidation. Exports to India, on the other hand, chalked a growth of 3.7 per cent to RM1.53 billion (cf. 2012: RM1.47 billion) as the market picked up mainly due to stronger structural policies supporting investment and trade. Logs contributed 9.6 per cent to Malaysia's total timber exports in 2013. The export of logs rose by 10.5 per cent to RM1.87 billion and 4.9 per cent to 3,159,902 m3 in volume terms. 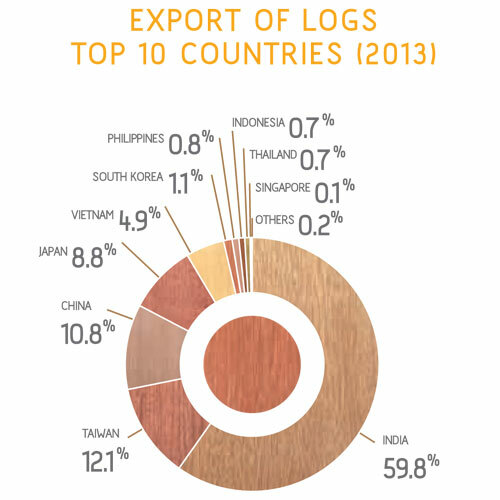 By region, Asia was the single largest export market for Malaysian logs, accounting for almost 100 per cent of the total log exports in 2013. Country-wise, India was the largest market, accounting for 59.8 per cent of the Malaysia's log export receipts in 2013. Exports to India increased by 6.4 per cent to RM1.12 billion but dipped 2.1 per cent to 1,788,275 m3 in terms of volume, partly due to the depreciation of Indian Rupee that weakened the purchasing of logs in India since June 2013. However, Malaysian logs remained competitive in the Indian market, with a market share of 27.3 per cent, trailing behind Myanmar (37.8 per cent). Malaysian exporters have been enjoying zero import tariff for logs to India under the Malaysia-India Comprehensive Economic Co-operation Agreement (MICECA) effective 1 January 2013. Taiwan and China were Malaysia's second and third largest markets in 2013, contributing 12.1 per cent and 10.8 per cent respectively. Taiwan's uptake of logs from Malaysia amounted to RM225.5 million, an increase of 19.4 per cent, and its volume reached 372,054 m3, an increase of 10.0 per cent. This was mainly owing to the increased demand for consumption in sawntimber and veneer production in the Taiwanese market. Log exports to China also grew by 4.8 per cent to RM202.6 million and 6.2 per cent to 372,224 m3 in volume terms respectively. This could be due to the high demand for Merbau and Kapur logs in the Chinese market as well as the difficulties faced by the Chinese importers in importing logs from Papua New Guinea, who have resorted to source more logs from Malaysia. Malaysia's export of sawntimber in 2013 contracted by 1.7 per cent to RM2.41 billion and 7.7 per cent to 1,898,696 m3 respectively. 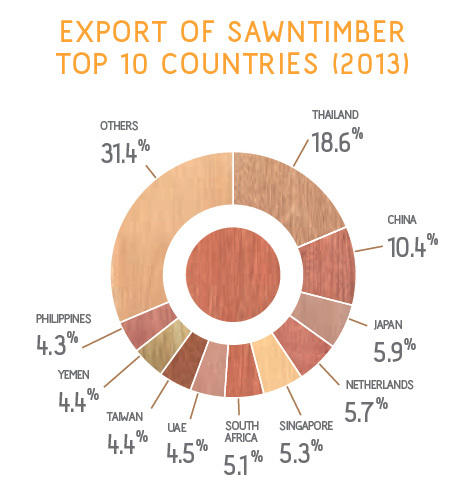 Sawntimber was the third largest export item, contributing 12.4 per cent to Malaysia's overall timber exports in 2013. By region, Southeast Asia was the biggest market for Malaysian sawntimber, accounting for 28.9 per cent of the total sawntimber exports in 2013. However, exports to Southeast Asian countries dropped by 7.9 per cent to RM696.9 million and its volume fell 14.6 per cent to 839,970 m3. Other major regional markets that imported Malaysian sawntimber were East Asia and West Asia with exports valued at RM570.9 million and RM445.1 million respectively. Malaysia's export of sawntimber to Europe decreased by 7.7 per cent to RM355.0 million and volume dropped by 2.9 per cent to 143,577 m3. The decrease could be attributed to the uncertainty amongst importers about the European Union Timber Regulation (EUTR) which came into force in March 2013 and economic jitters in the European markets, apart from the declining market shares by tropical hardwoods versus temperate hardwoods that had been witnessed in recent years. Thailand was Malaysia's largest importer of sawntimber, accounting for 18.6 per cent of the total sawntimber exports in 2013, followed by China (10.4 per cent) and Japan (5.9 per cent). However, Thailand's sawntimber imports dipped 14.5 per cent to RM449.6 million and decreased by 27.1 per cent to 461,249 m3 in terms of volume. In fact, Thailand's overall import of sawntimber worldwide has dropped considerably by 66.7 per cent to 3,563,030 m3 in 2013 (cf. 2012: 10,712,412 m3). This amongst others could be due to the depreciation of Thai Baht against the US Dollar that hit its lowest level since 2006 arising from the prolonged political unrest in the country. As one of Malaysia's neighbouring countries, Thailand often adopted the "wait-and-see" approach owing to the supply volatility of Malaysian Keruing, Kempas and Yellow Meranti. In contrast, China's uptake of sawntimber from Malaysia was on an upward trend with a hike of 30.1 per cent year-on-year to RM249.9 million and 26.8 per cent to 186,365 m3 in terms of volume. The Chinese economy rebounded strongly in the second half of 2013 due to investment acceleration. The continuous shrinking supply of African and North American sawntimber has created an opportunity for Malaysia to increase its market share in the Chinese market especially for Keruing sawntimber. Malaysia's export of sawntimber to Japan fell 19.5 per cent to RM143.3 million and 25.4 per cent to 78,408 m3 in volume terms, partly led by the hesitation amongst the Japanese importers on the stimulus and reconstruction spending unwind and consumption tax hikes that would be implemented in 2014. Increased demand in the European and North American sawntimber was more noticeable, mainly due to their stable pricings towards the second half of 2013. 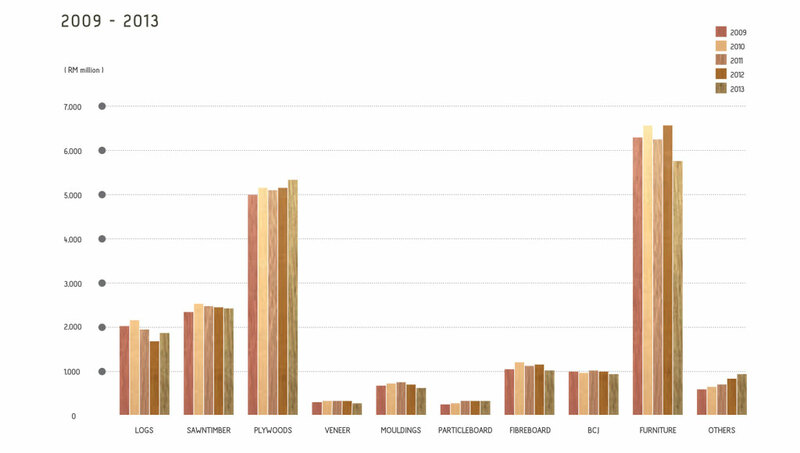 Plywood was the second largest export item amongst Malaysia's timber and timber products, contributing 27.2 per cent to the overall timber exports in 2013. Although plywood exports increased by 3.6 per cent to RM5.32 billion, it has declined slightly in volume by 0.2 per cent to 3,398,082 m3. 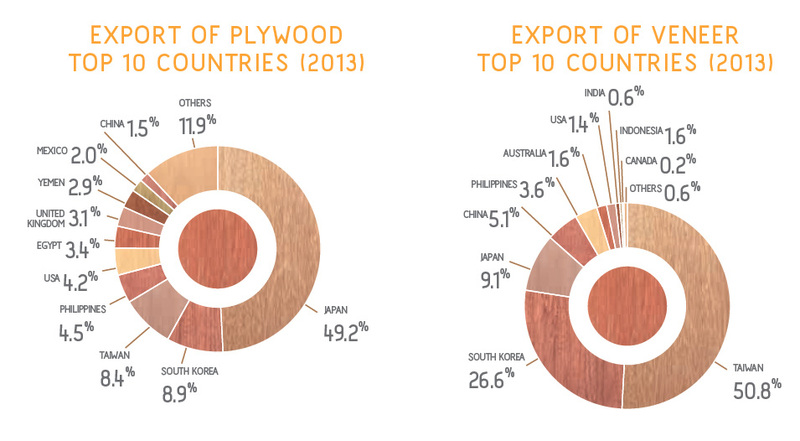 By region, East Asia was the largest market accounting for 69.4 per cent of Malaysia's total plywood exports. The export reached RM3.69 billion, an increase of 2.0 per cent, but the volume declined by 1.6 per cent to 2,371,625 m3. Southeast Asia and the Americas contributed 7.9 per cent and 6.4 per cent to the total exports, valued at RM419.1 million and RM339.5 million respectively. Japan was the single largest market for Malaysian plywood, accounting for 49.2 per cent of the total plywood exports in 2013. Japan's import of plywood increased by 3.0 per cent to RM2.62 billion, with a volume of 1,623,076 m3, a 0.9 per cent increase. This was mainly attributed to the Japanese new construction starts which improved by 11.0 per cent to 980,025 units in 2013 (cf. 2012: 882,797 units). South Korea and Taiwan were the second and third largest importers of Malaysian plywood, with imports valued at RM471.5 million (340,914 m3) and RM445.2 million (310,902 m3) respectively. Exports to South Korea fell 4.8 per cent and 6.6 per cent in both value and volume terms respectively, following the prolonged slump in the South Korean housing and real estate markets since 2008. The country's housing starts decreased by 3.4 per cent year-on-year to 83,744 units in 2013. In addition, Malaysian plywood faced stiff competition from Finnish plywood that was gaining popularity in the South Korean market over the past three years, with export increased from 110,652 m3 in 2011 to 1,212,926 m3 in 2013. Exports to Taiwan increased by 8.8 per cent but decreased by 4.9 per cent in volume terms. Malaysia was the largest plywood supplier in Taiwan but volume-wise China has overtaken Malaysia to become the biggest plywood supplier in 2013. 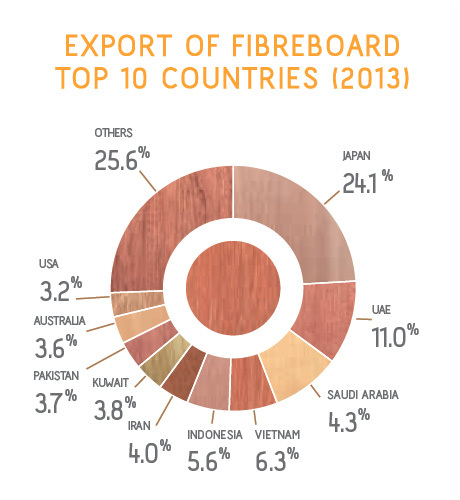 In 2013, Malaysia's export of veneer accounted for 1.5 per cent of Malaysia's overall timber exports. However, veneer exports showed a 13.8 per cent drop in value (RM287.2 million) as well as a fall of 17.6 per cent in volume (220,551 m3). East Asia was the largest export market for Malaysian veneer, accounting for 91.7 per cent of total veneer exports. The export of veneer to East Asia however shrunk by 9.4 per cent to RM263.5 million and 12.2 per cent to 208,183 m3 in volume terms respectively. Taiwan, South Korea and Japan were the top three major markets for Malaysian veneer. However, exports to Taiwan showed a declining trend, registering a drop of 1.6 per cent to RM146.0 million in value terms and 9.1 per cent to 113,364 m3 in volume terms. Malaysia was the largest veneer supplier in Taiwan with a market share of 52.1 per cent, followed by China (20.9 per cent) and Vietnam (8.7 per cent), New Zealand (7.4 per cent) and others (10.9 per cent). Malaysia's export of veneer to South Korea also declined by 13.6 per cent to RM76.5 million and 10.1 per cent to 66,361 m3 in volume terms respectively. China has dominated the South Korean market with its high value decorative veneer that posed a stiff challenge to Malaysia. The Japanese market, on the other hand, was dominated by Russian veneer with a market share of 52.0 per cent, followed by China (29.3 per cent), Malaysia (5.3 per cent) and other smaller suppliers (13.4 per cent). Japan's import of Malaysian veneer slipped by 25.4 per cent to RM26.1 million, with a volume of 12,996 m3, a drop of 21.7 per cent. 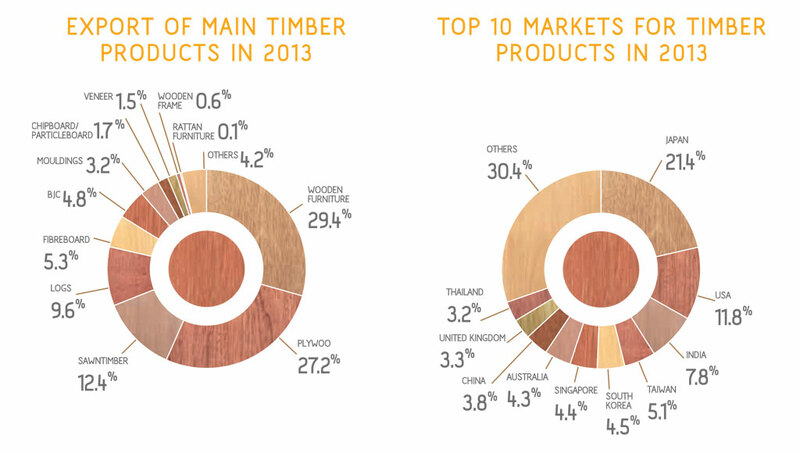 MDF was the fifth largest export item, contributing 5.3 per cent to Malaysia's overall timber exports in 2013. However, the MDF export value and volume dropped by 10.6 per cent (RM1.03 billion) and 7.6 per cent (1,045,531 m3) respectively. By region, West Asia imported RM401.1 million worth of Malaysian MDF, accounting for 39.0 per cent of the total MDF exports. However, this represented a decline of 16.1 per cent in value terms and 18.7 per cent in volume terms (472,593 m3). Japan has been a traditional market for Malaysian MDF accounting for 24.1 per cent of Malaysia's total MDF exports in 2013. Japan's MDF imports rose by 2.3 per cent to 165,710 m3. The positive uptake was due to the increase in bulk purchasing for domestic consumption that was stimulated by the Japanese's Abenomics economic policies since December 2012. However, in value terms the export dropped by 10.0 per cent to RM247.2 million mainly due to the shift to basic grades and thicker panels of MDF offered by Malaysian exporters and the substantial devaluation of Japanese Yen against the US Dollar in 2013. The United Arab Emirates (UAE) was the second largest market after Japan for Malaysian MDF. The exports fell 10.4 per cent and 38.4 per cent to RM113.4 million and 139,940 m3 respectively. The decline was mainly due to the abundant supplies of low-priced Chinese, Indonesian and Thai MDF in the UAE market. On the contrary, Saudi Arabia's uptake of Malaysian MDF registered a positive growth of 36.4 per cent to RM93.1 million, making Saudi Arabia the third largest market. The export volume reached 105,596 m3, representing a positive increase of 68.4 per cent, buoyed by the strong government stimulus and rapid credit growth. With a growing population of 29.2 million, Saudi Arabia has been facing affordable housing shortage which US$65 billion was earmarked in 2013 by the King of Saudi Arabia, His Majesty King Abdullah, for construction of 500,000 low-cost housing units across the Kingdom. Melamine MDF, veneer MDF and plain MDF of various sizes were largely consumed by local factories producing furniture, kitchen cabinets, wardrobes, drawers, doors and other interior applications. Mouldings contributed 3.2 per cent to Malaysia's total timber export earnings in 2013. The exports declined by 13.0 per cent and 15.3 per cent to RM619.1 million and 225,336 m3 respectively. 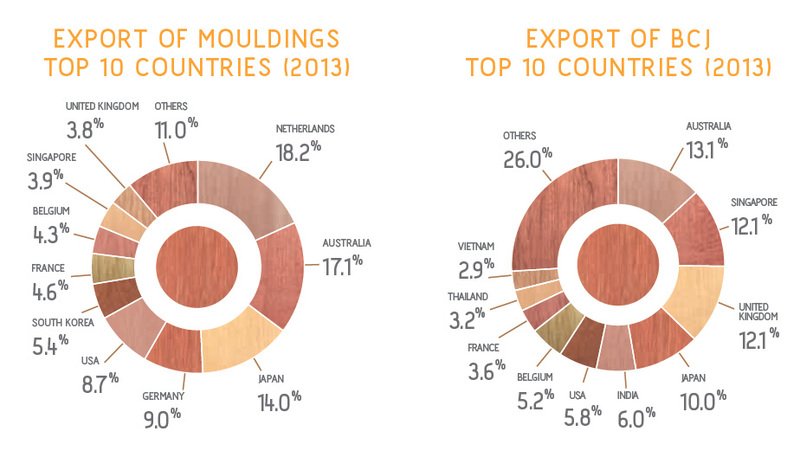 Amongst the regions, Europe was the biggest market contributing 42.4 per cent of the total export of mouldings in 2013. However, the exports to this region dwindled by 14.7 per cent to RM262.8 million and 21.9 per cent to 82,828 m3. This was followed by East Asia and the Oceania/Pacific regions which contributed 22.0 per cent and 17.2 per cent respectively to the total export receipts. Similar to Europe, exports to East Asia decreased by 13.1 per cent to RM136.4 million and 15.5 per cent to 56,510 m3. Exports to Oceania/Pacific region however showed an upward trend, registering a hike of 4.7 per cent in value to RM106.3 million and 5.3 per cent in volume to 37,785 m3. Despite its weak economy, The Netherlands retained its position as the largest importer of Malaysian mouldings, accounting for 18.2 per cent of the total mouldings exports in 2013. The export marginally increased by 0.8 per cent to RM112.5 million. However, the export volume dropped by 9.4 per cent to 34,694 m3. The Dutch economy had been shrinking since the second quarter of 2012, weighed down by a persistent slump in the housing market that hit highly indebted households. Australia and Japan contributed 17.1 per cent and 14.0 per cent to the total mouldings exports in 2013, making them the second and third largest markets respectively. Shipments to Australia increased by 5.4 per cent to RM105.7 million and 5.9 per cent to 37,522 m3. However, China has increased its market share and overtook Malaysia to be the third largest mouldings supplier in Australia, after Indonesia and New Zealand. Malaysia's export of mouldings to Japan dropped by 13.7 per cent to RM86.8 million and 19.5 per cent to 29,187 m3. Demand for Vietnamese mouldings in the Japanese market has increased and the country has overtaken Malaysia to become the third largest mouldings supplier, after China and Indonesia. In 2013, Malaysia's export of Builders' Carpentry and Joinery (BCJ) decreased by 4.4 per cent to RM949.6 million. It contributed 4.8 per cent of Malaysia's total timber exports in 2013. By region, Europe was the largest market for Malaysian BCJ, accounting for 30.7 per cent. Malaysia's export of BCJ to Europe fell 2.1 per cent to RM291.9 million. Southeast Asia was the second largest regional market, accounting for 21.1 per cent, with export of RM200.1 million, an increase of 6.6 per cent year-on-year. Country-wise, Australia was the leading importer of Malaysian BCJ in 2013, followed by Singapore and the United Kingdom. Exports to Australia rose by 7.0 per cent to RM124.3 million, even though the construction sector was hardly triggered by the increasing housing building approvals, given the lack of full-time workers, which caused the increase of housing prices throughout 2013. The Australian housing building approvals in 2013 increased to 172,560 units, an increase of 17.7 per cent (cf. 2012: 146,612 units). Australian retailers reported that Malaysian BCJ, especially flooring, was of good quality, well priced and in a good range of sizes and species. Singapore, as a re-export hub, imported RM115.2 million worth of Malaysian BCJ in 2013, a year-on-year increase of 3.2 per cent. Being Singapore's closest neighbour, Malaysia continued to be the single largest supplier of BCJ to Singapore, with a market share of 47.2 per cent, followed by China (26.3 per cent), Indonesia (9.0 per cent), Vietnam (8.4 per cent) and others (9.1 per cent). Improvement was also seen in Malaysia's export of BCJ to the United Kingdom, with export of RM114.5 million, an increase of 12.4 per cent. Since the first quarter of 2013, construction activities had picked up considerably in the United Kingdom; initially, this was due to a rapid rise in house buildings; later, growth in new infrastructure and a recovery in London's commercial activities had built upon further rises in private housing. Malaysia remained as the world's eighth largest furniture exporter for three consecutive years, with export valued at RM7.36 billion in 2013. However, the furniture exports dropped by 8.0 per cent year-on-year. Of the furniture exported by Malaysia, wooden furniture was the biggest export item with a share of 78.9 per cent, followed by seats and their parts (9.3 per cent), metal furniture (7.5 per cent), parts of furniture (3.7 per cent), plastics furniture (0.3 per cent) and others (0.3 per cent). 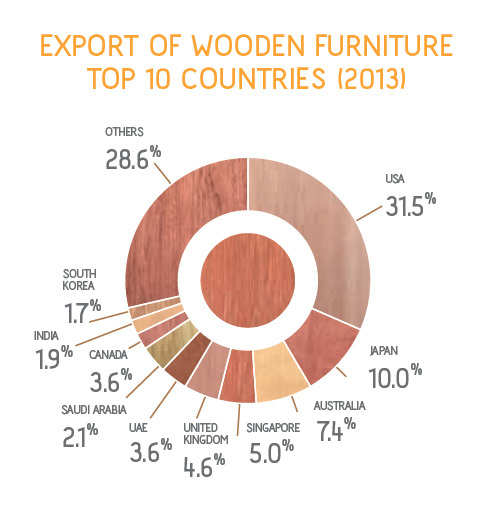 In 2013, Malaysia's export of wooden furniture reached RM5.74 billion, a decrease of 12.1 per cent year-on-year. The US was the single largest market for Malaysian wooden furniture, accounting for 31.5 per cent of Malaysia's total wooden furniture exports in 2013. However, Malaysia's export of wooden furniture to the US fell 7.9 per cent to RM1.81 billion, although housing units completed in the US in 2013 stood at 764,400, a year-on-year increase of 17.7 per cent. Malaysia faced intense competition from Chinese and Vietnamese furniture exporters as well as other emerging players from India and Indonesia in the US, particularly on casegood furniture. Japan has maintained its position as the second largest importer of Malaysian furniture, accounting for 10.0 per cent of the total wooden furniture exports. The exports reached RM571.3 million, a drop of 17.6 per cent. The Japanese market was largely dominated by Chinese furniture with a market share of 60.9 per cent. Apart from China, Malaysia was outperformed by Vietnam, Taiwan, Thailand and Indonesia in supplying furniture to Japan in 2013. Malaysia's export of wooden furniture to Australia, the third largest furniture market, marginally dropped by 0.7 per cent, valued at RM424.9 million. Chinese furniture has also dominated the Australian market with a market share of 62.9 per cent. In West Asia, the UAE was the single largest market for Malaysian furniture, with export valued at RM206.6 million, accounting for 3.6 per cent of the total wooden furniture exports. Malaysian furniture was seen as "value for money" with competitive pricing and quality finishing in the Middle East. Export of Malaysia's timber and timber products, including furniture, is expected to see improvement above the 2013 levels as global economic growth is anticipated to rebound in 2014 supported by monetary policies amid improving financial conditions in the affected countries. A major impulse to global economic growth is expected to emerge from the US, whose economy grew at a faster-than-anticipated pace in the second half of 2013. This was led by its buoyant domestic demand, robust inventory accumulation and strong export growth. More optimisms are expected to derive from the US Federal Reserve's monetary stimulus, easier bank lending conditions and higher household wealth. A recovering real estate sector is also expected to translate into a greater demand in construction materials and household products, including furniture. With the exception of the United Kingdom, Germany and France, the growth in the rest of the Euro area is expected to remain weak as high debt and financial fragmentation hold back domestic demand. However, the European Commission expects the job market to improve; forecasting unemployment would fall to 10.1 per cent in 2014. Market confidence in the United Kingdom hardwood sector is expected to grow, led by new house-building revival plan, attributable to the government's "Help to Buy" mortgage support scheme. The German construction activity has been on the rise since the second quarter of 2013 and is expected to remain optimistic in 2014 which might lead to improved export of timber and timber products from Malaysia. In Japan, some growth drivers are expected to strengthen, notably private investment and exports, given increased growth in their partner countries and the substantial Japanese Yen depreciation throughout 2013. However, Japan's economic activities are anticipated to slow down as industry players are doubtful about the re-construction spending unwinds and consumption tax hikes that are expected to be implemented in 2014. Emerging markets had been roiled by capital outflows in 2013 as their investors began positioning for the US Federal Reserve to start tapering its monetary stimulus. The World Bank forecast that the Chinese economic growth would remain at about 7.6 per cent in 2014, as the Chinese authorities gradually rein in rapid credit growth and make progress in implementing their reform blueprint so as to put the economy on a more balanced and sustainable growth path. India's growth is expected to recover from 4.4 per cent in 2013 to 5.4 per cent in 2014, supported by a slightly stronger global growth, improving export competitiveness and implementation of investment projects. The International Monetary Fund (IMF) forecast the regional growth in the Middle East and North Africa (MENA) to rise moderately in 2014, led by the oil-exporting countries, where high public spending contributes to buoyant non-oil activities. However, high unemployment, low competitiveness, and in many cases, large public deficits would continue to weigh on economic prospects in the region. In the UAE, the rise in real estate especially for the residential sector had improved market sentiments. The emirate of Dubai in UAE has been awarded to host World Expo 2020 that is expected to generate national income of US$24.2 billion, encouraging developers to launch more building construction projects that would lead to increased consumption of timber and timber products. Among Southeast Asian economies, the biggest changes in the World Bank's economic forecasts were for Thailand and Myanmar. The World Bank forecast Thailand's economic growth at 3.0 per cent in 2014, mainly attributable to a recovery in external demand that would lift growth in Thailand. Domestic demand in Thailand, however, is predicted to remain dampened because of the ongoing political unrest, which has affected tourism receipts, public investment and investor confidence. Economic growth in Myanmar is likely to stabilise at 7.8 per cent in 2014, after the country made positive progress in 2013 on their macro-economic reforms. Myanmar's ban on log exports in April 2014 might spur countries like China and India to turn to Malaysia for supply of logs and sawntimber.